I’ve talked about testing few DoS tools that can put heavy load on HTTP servers in order to bring them to their knees by exhausting resource pools. 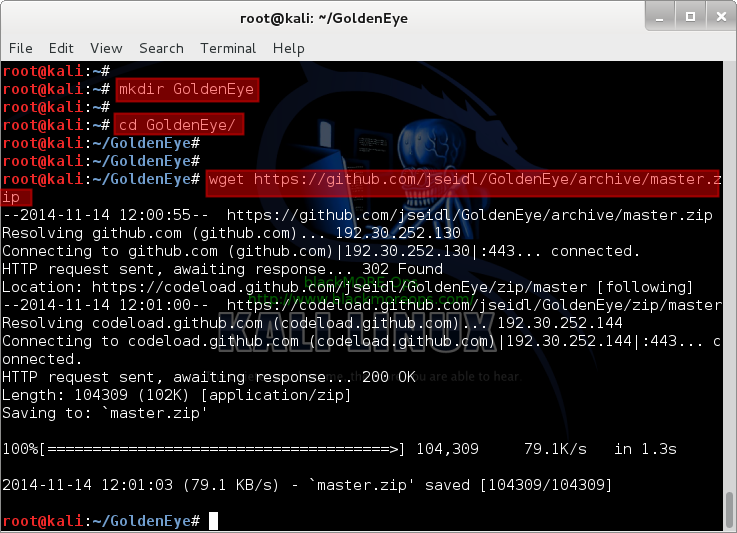 GoldenEye is the first of those tools and it is one of the newest I discovered in GitHub. 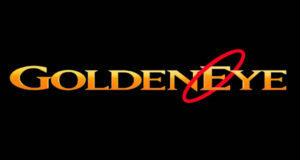 You can DoS websites with GoldenEye and bring it down almost within 30 seconds depending on how big their memory pool is. Of course, it wont work on protected servers and servers behind a proper WAF, IDS, but this is a great tool to test your own Web Server for load testing and amend your iptables/Firewall rules accordingly. I will put several warnings and disclaimers in this post so that even the most feeble minds wont be able to deny reading those. Application-layer DoS and DDoS attacks are attacks that target Windows, Apache, OpenBSD, or other software vulnerabilities to perform the attack and crash the server. A protocol DoS and DDoS attacks is an attack on the protocol level. This category includes Synflood, Ping of Death, and more. This type of DoS and DDoS attacks includes ICMP floods, UDP floods, and other kind of floods performed via spoofed packets. The word DoS and DDoS is used loosely as when you attack from a single machine, it’s usually considered as a DoS attack. Multiply a single attacker from a botnet (or a group) then it becomes a DDoS attack. There are many explanations to it, but just know that no matter which type of attack it is, they are equally detrimental for a server/network. So let me introduce GoldenEye. in order to bring them to their knees by exhausting the resource pool. and any malicious usage of this tool is prohibited. THIS SOFTWARE IS PROVIDED FOR EDUCATIONAL USE ONLY! THE AUTHOR (or blackMORE Ops / darkMORE Ops) DOES NOT TAKE ANY RESPONSIBILITY FOR IT. BY USING THIS SOFTWARE YOU AGREE WITH THESE TERMS. I prefer to make a folder for everything. I will just do that. You do what you need to do. 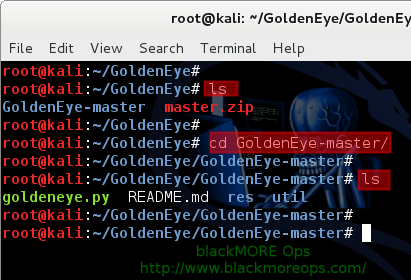 So I made a folder named ‘GoldenEye‘ and changed directory to that. Then used wget to pull down the master archive. Codes are highlighted in red. Once download completes, unzip the master.zip file. 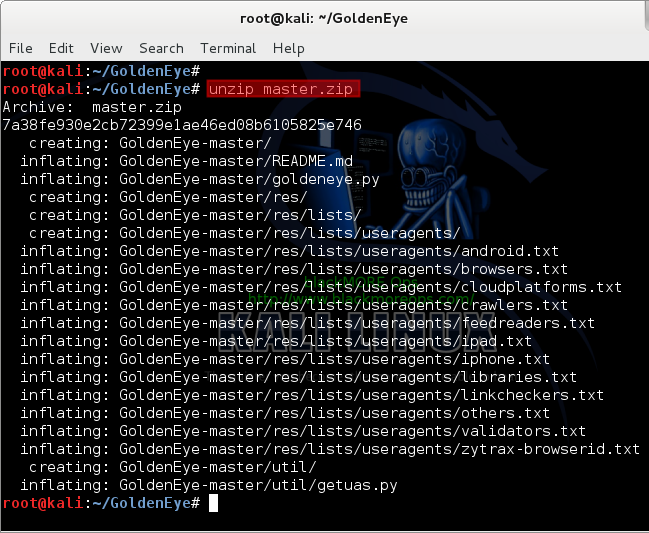 This creates a new folder named GoldenEye-master.